Many scholars have declined to accord Cilappatikaram the status of an epic for a number of reasons. According to some, it was not the story of royals and gods and nor did it culminate in to a war of ‘epic’ proportions, like all the well-known epics of both India and others. However, what one cannot overlook is the enormity of the epic and the depiction of the Tamil culture in the poetic verse form. While it has all the elements of an epic, the comparisons with Ramayan and Mahabharat have left the epic in the backyard of literature; even so that many a Tamilian is unaware of this masterpiece of Tamil literature. Many have questioned Kannagi’s cursing the city of Madurai even when the King and the Queen had died due to the misjudgement. When Kovalan and Kannagi enter the city, they were supported by the locals and even helped by a few. To mete out such fury to the locals, who were not at fault is seen as a chink in the characterisation of Kannagi. Another very modern criticism was that when Kannagi was left by her husband for a dancing girl, where was the need for her to take him back, when all he had come back was due to a misunderstanding with Matavi? He had come back only because he felt cheated by Matavi and not because of realisation that he was wrong. Modern day feminists feel that eulogising such ‘sacrificing’ aspects of women’s characterisation, is erroneous for the self-respect of any woman. This only leads to greater promiscuity by men as they know that their wives were always there when needed, and end up having the best of both the worlds! Besides the critics of literature having their say, modern day politics too has had its share of controversy. 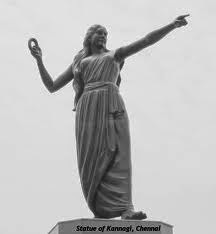 The statue of Kannagi was first installed by the Annadurai DMK government way back in 1968, as the pride of Tamil Nadu. According to a politician, Kannagi’s statue was “a symbol of the two principal roots of Tamil culture, aram (righteousness) and veeram (valour)”. In 2002, after a truck rammed into the pedestal of the statue, the statue was shifted from its place and taken to a museum, as it was supposed to be obstructing the traffic. People saw in it a conspiracy, as it was rumoured that the then Govt had got it removed as astrologers had warned the AIADMK chief Ms. Jayalalitha that the presence of the statue would bring her bad-luck. This led to an agitation and the statue was later installed at the Marina beach by the DMK Govt, where it still stands. Finally, to conclude, in all the analysis and criticism, one thing should not go unnoticed, especially at this stage of our political situation. The King of Pandiyan should be an example of what every leader or ruler should be. The king gave up his life, nothing less, for a mistake that he made. How I wish we had at least a few of such leaders in the current state of our national politics! With this, I conclude the series on the Cilappatikaram. Amongst all the well known epics of the world, this is probably the only one which has a female as the central character. While the focus is on the chastity and the fidelity of Kannagi, there is no denying that she is the hero of the epic. Her character is above suspicion and her chastity had the power to invoke the gods, who had no choice but to attend to her (this is similar to the character of Nalayani http://utkarshspeak.blogspot.in/2014/02/why-did-draupadi-have-to-suffer.html ). Kannagi in Tamil means ‘virgin’, this gives rise to the comparison of Kannagi with the Panch-kanyas of the two epics, Ramayan and Mahabharat. Her heroism shows up when she doesn’t take her husband’s death as her destiny and simply end her life. She rushes to the court, gets her husband’s name absolved of the allegation, and punishes both the king and the city which had harmed her husband and her marital life. Unfortunately in present times, she is remembered more for her chastity than her courage to question the Kings judgement and even punishing him and his kingdom for the same. At a time when Sanskrit dramas were eulogising the Kings and the Gods, this Tamil literature had the courage to eulogise an ordinary mortal and show the royalty, guilty of injustice. It sure needed courage to write an epic where one was questioning the sense of justice of the King. Even if we accept that the epic was based on an already known folktale, the author did not take liberty to change this aspect, as we have seen such changes take place in numerous instances in other versions of the established epics. Many scholars have marvelled at the fact that the author, Ilango Adigal, though a Jain monk, has written in details of worldly life with a flair which is both surprising and unbelievable. Scenes of love, pangs of separation and the life of royalty rubs shoulders in details with the lives of common folks and the lives of Jain monks and nuns. Matavi’s dancing skills along with the music of the times too are mentioned with the details befitting that of a connoisseur. This remarkable feat though has been questioned by some skeptics, but at the end of it all, there is enough evidence to the fact that the epic was indeed written by Adigal. Also, Adigal does not use the epic to propagate Jainism (though he has a Jain nun as an important character); he has taken into consideration the basic Tamil life and the religious status of the people of the time, which was primarily Brahminism with some spread of both Buddhism and Jainism. A woman with high moral standards will not only be respected, but even worshiped. The above is a message for both the royalty and the common man. While the women were eulogised for their fidelity, the men are asked to lead a moral life. In one scene, Kavunti, a Jain nun turns two people into jackals when they teased Kannagi. According to Kavunti, disrespect towards anybody, more so women, was not a trivial thing. Another interesting aspect is the characterisation of Matavi, the proverbial ‘other woman’. While Matavi was a dancing girl, whose life revolved around music, dance and riches, she is treated with a lot of respect. Her knowledge of music and dance is exemplary. She gives birth to the daughter of Kovalan, a sign of her love for Kovalan. She even pleads for his return, when Kovalan leaves her for good. In the entire epic, nowhere has Matavi been blamed for breaking the relationship of the happy couple, even Kovalan blames destiny for the break-up and not Matavi. Even the parents of Kovalan blame their son, but not Matavi. Later, Matavi is seen becoming a Buddhist nun, as a sign of atoning for her act. It called for a lot of maturity by the author to create such a character, and needless to say, for the audience to even accept such a character. However, such a masterpiece is not devoid of criticism by the modern scholars. Cilappatikaram has its share of brickbats too. Yesterday, we read about how Kovalan and Kannagi’s happy married life was broken up by Kovalan’s affair with a dancing girl, Matavi and how due to a misunderstanding with Matavi, Kovalan returns to his wife. Kovalan and Matavi decided to start a new life in the nearby town of Madurai. Part 2 - In the city of Madurai, Kovalan came across a goldsmith and showed him the anklet for sale. The goldsmith had in reality stolen a similar anklet of the Pandian Queen. He took the opportunity to absolve himself. He asked Kovalan to wait for him as he wanted to show the anklet to the Queen, as such an anklet could be bought only by her. The goldsmith then went to the King and told him that he had found the thief who had stolen the Queens anklet and was waiting at his shop. During those days, the Queen was not on talking terms with the King due to some misunderstanding. The king seized the opportunity to impress upon her and without getting into the facts of the matter, ordered immediate execution of the ‘thief’. The soldiers reached the goldsmiths shop and killed Kovalan, who had no idea of what had happened behind him. When Kannagi came to know about her husband’s execution, she rushed to the palace. She proved to the King that the anklet shown by the goldsmith was hers and not the Queen’s as she had the other one too. Besides, her anklet had rubies inside it, while the Queen’s had pearls. The King realised his mistake and as a sign of his guilt, his sceptre had bent for all to see the injustice committed by the King. The King died of shock and so did the Queen. But Kannagi’s wrath had not been satiated with the death of the King and the Queen. She was angry that her husband was killed without even being heard and the crime was done by none less than the king. In a state of extreme anger, she pulled out her left breast and hurled it at the city, invoking the god of fire; to burn down the entire city which had wronged her and her husband, albeit, leaving the good. The epic mentions that due to the power of her chastity, fire was compelled to burn down the city of Madurai. 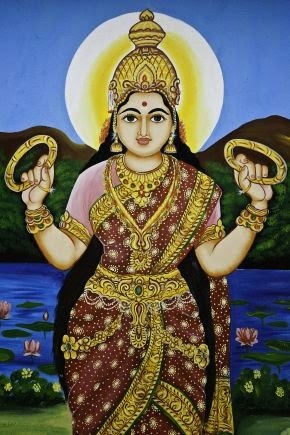 The patron goddess of the royal family approached Kannagi and calmed her. She explained to her the reason behind the tragedy. 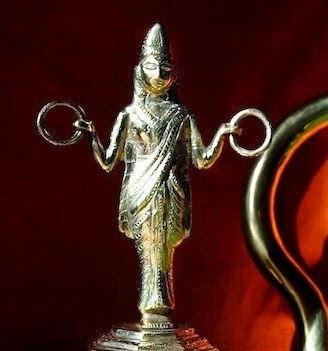 According to the goddess, both Kovalan and Kannagi were connected in their previous birth. In their previous life, Kovalan had killed Kannagi’s husband by mistake, and in sorrow Kannagi had committed suicide – both having committed the sin of taking life, Kovalan took someone else’s, while Kannagi took her own. No matter how virtuous a life one leads, one cannot escape the sins of one’s previous life and the tragedy that both had faced was due to their past sins. her curse and the fire abated. On the advice of the goddess, she reached a hill in the nearby kingdom of Chera, where after fifteen days, she died. Lord Indra himself came down and took the soul of Kannagi to the heavens, where she was united with Kovalan. In the meanwhile, the story of her death spread all over and in due course of time, Kannagi was deified and people started worshiping Kannagi (aka Pattini in Sri Lanka) as the goddess of chastity and fidelity! Part 3 - In the final segment of the epic, the King of Chera heard the story of Kannagi and how it was from his region that she had left for the heavens. The King was impressed by the journey of Kannagi through three kingdoms of the Tamil kingdom and took it on him to build a statue of Kannagi. He journeyed to the North to get a block of stone from the Himalayas for carving her idol. After a journey to the North and back, through some battles, the King returned with a block of stone suitable for carving the idol of Kannagi. A temple was built in honour of the goddess Kannagi and hailed as the symbol of chastity and fidelity.